Description: Vintage Detroit and Mackinac RS2U from 1946 works one of her last summers for owner Lake State Railway, switching cars in the Alpena Yard. Description: LSRC Forty-Six Nine earns her keep in northern Michigan. Description: LSRC 469 is the last opperating RS2 in regular service. But its down for the count and is in the soon to be closed Alpena, Mich. shops with a bad cylinder head which the shop forces can't locate. Description: Yes, I know three are MLW's. So they are Canadian ALCo's. Description: RS2U 469 sits while its crew is at luch. The 469 is the second to last RS2 and the last regularly operated one. Description: Still surviving in Saginaw, the only one not cut up. Description: waiting to be shipped out. 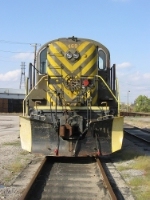 Description: LSRC 469 and 974 are stored at the facilities in Saginaw. Photo taken with permission from LSRC/SBS. Title: LSRC 181, 798,3504,3500,469, & 1280. Description: Lake State engines 181 X D&M, 798 X Kelona Pacific, 3504 X Kelona Pacific, 469 X D&M, & 1280 X Kelona Pacific. All of these are being replace and won't be around much longer. Photo by Mike Fogelsinger.